Its started... Ive heard of several women in this country who are either going through the procedure or have emigrated to Canada already. The reason given is the recognition of their relationships as valid. 'tis shaping up to be sad day for Australia. As I type this it looks as though the garden gnome will be re-elected as our Prime Minister. Been a while since Ive had any random thoughts it would seem *grin*. I turned 35 a few weeks ago and freaked out; Kyls keeps threatening to trade me in LOL. Ive also gone back to school which is the best decision Ive ever made. Its funny... Ive gone back to school so as to escape being a chef and I work part time in said industry to help fund the escape plan... no that's not the funny part. The funny part is the fact that Im actually enjoying the job for the first time in years... Go figure. Today My Lady and I celebrate 7 years together, WOO HOO!! To those who said it wouldn't last and those who actively tried to split us up, I have two words for you and the first one starts with an F.
Just a small thought along the lines of a rant. A pet hate of mine are the ignorant sods who ask (some even beg and plead) for feedback on their stories, you provide said feedback and you never receive so much as a thanks for reading! And I'm not even talking about constructive criticism, I mean positive feedback. Now I do not expect these people to fall at my feet with thanks or shower me with gushing flowery prose, a simple "Thanks" or "I'm glad you enjoyed it" would be just fine. I have one thing to say to those of you who do this kinda thing: No wonder you have to beg for the goddamn feedback!! 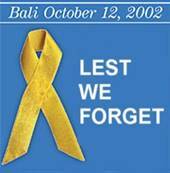 Yesterday was the first anniversary of the Bali terrorist bombings which claimed 88 Australian lives. In total 202 people died (including a terrorist) from 22 countries. The individuals responsible have been tried and sentenced, but for most the pain lingers. I read somewhere that per capita for Australia to lose that many it equates to 1000 American lives, and yet the Indonesian president claimed there was no domestic political reason for her to go to the memorial service in Bali. I had a big wake up call today for two reasons, the first being the photo in the paper of my lady's cousin who was killed in the Bali blast. The second was a letter that arrived in the mail, a thank you card from the family of a friend who died from cancer recently. I knew Selena for almost 20 years, we went to school together, she would have turned 34 at the end of this week. In the end she left us very suddenly, not even her fiancé was able to make it back in time to see her. I hadn't seen her myself for a few weeks and it is something that I will forever regret. Selena's death brings the total up to 4 in the last year and a half. Four friends Kyls and I have lost, two to suicide and two to cancer. RIP Jodie, Atheaus, Cory and Selena. You are missed.